Check out Tobi's Believe It Or Not Wrap Dress Stripes and spaghetti straps: our new fav combo. The Blue and White Believe It Or Not Wrap Dress is a cami dress for first dates and festivals with its edgy back straps, finished with statement ring details at the back waist. With sandals, sneaks or booties, you better believe in this striped dress. Stripes and spaghetti straps: our new fav combo. 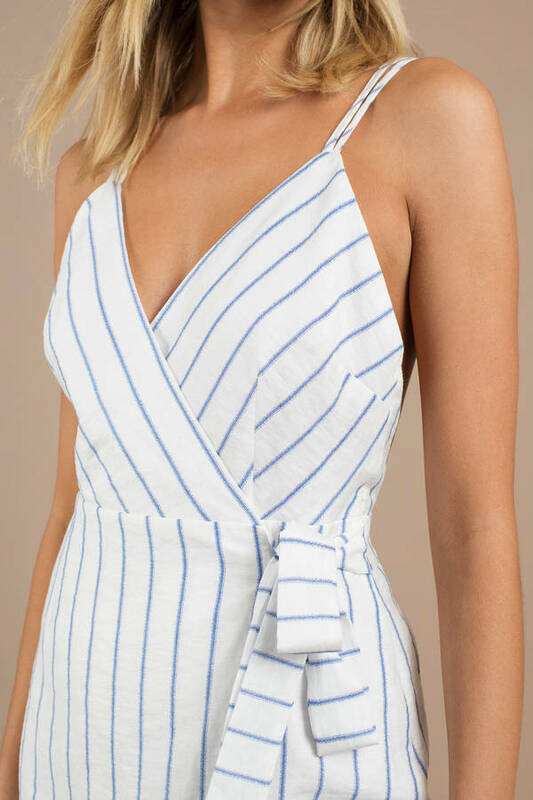 The Blue and White Believe It Or Not Wrap Dress is a cami dress for first dates and festivals with its edgy back straps, finished with statement ring details at the back waist. With sandals, sneaks or booties, you better believe in this striped dress. Stripes and spaghetti straps: our new fav combo. The Black Believe It Or Not Wrap Dress is a cami dress for first dates and festivals with its edgy back straps, finished with statement ring details at the back waist. With sandals, sneaks or booties, you better believe in this striped dress. Blue and White modeled on a size Small.